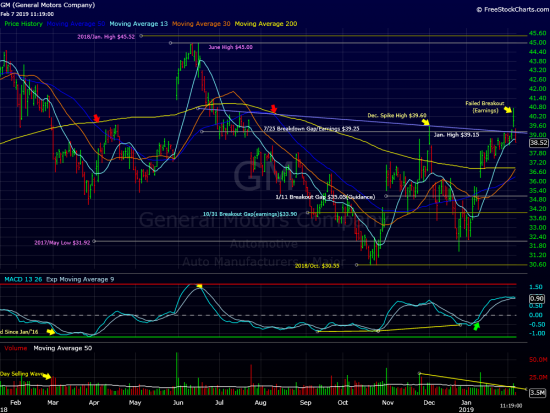 GM’s powerful earnings driven breakout yesterday appears to have failed. The stock blew through a key overhead trendline(linked July/Dec/Jan highs) on Wednesday with a huge upside gap. By the close it appeared the breakout had lost a bit of steam. Today the weakness continues in a big way. GM is down 3.4% and is trading near this week’s low($38.35). Yesterday’s news driven buyers are taking some considerable heat. A close below the $38.00 area on Friday would be quite damaging. We are watching the action closely. At time of publication we are long GM in some managed accounts.